Zanu PF is buying luxury cars worth a staggering $5 million for former Cabinet ministers recently deployed to the ruling party’s headquarters by President Emmerson Mnangagwa, it has been revealed. Mnangagwa appointed several former ministers that he did not accommodate in his new Cabinet to work for Zanu PF on a full time basis. The Zanu PF leader said he needed a leaner Cabinet to transform the economy and reverse years of economic decline blamed on the ruling party. It has since emerged that the heavyweights that include Obert Mpofu, Patrick Chinamasa and Sydney Sekeremayi, among many others, will soon take delivery of Toyota VX 200 Land Cruisers from South Africa. The ruling party is said to have received the money to buy the top-of-the-range vehicles from a local tycoon with vast interests in the energy sector. 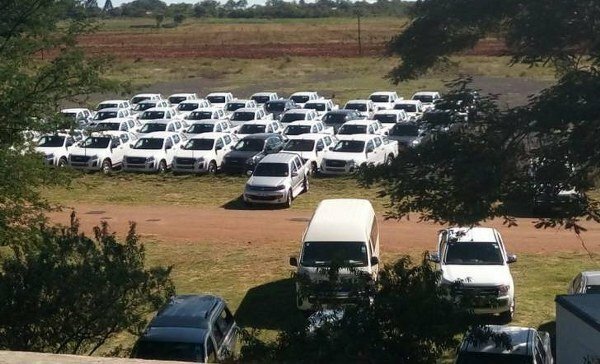 Zanu PF director of administration Dickson Dzora confirmed that the ruling party was buying top-of-the-range vehicles, but dismissed claims that the deal was financed by the businessman with links to Mnangagwa and Vice-President Constantino Chiwenga. “Zanu PF is not receiving any vehicles from anyone, that is total rubbish,” he said. “As a party, we bought vehicles for our members during elections and we will continue buying vehicles for them. However, sources insisted the tycoon was heavily involved in the importation of the vehicles. At least 50 cars are set to be delivered anytime from now, the sources revealed. Zanu PF secretary for transport July Moyo and spokesperson Simon Khaya Moyo were not reachable for comment. Mnangagwa’s government, which recently introduced austerity measures to rescue the economy from collapse, has been emphasising that Zimbabweans “need to take the pain” if a turnaround is to be achieved. The former ministers that were deployed to Zanu PF headquarters are said to be entitled to perks equivalent to those given to ministers. They insist that they should direct government policy and were vocal against Finance minister Mthuli Ncube’s austerity measures. However, war veterans last week wrote a stinging petition demanding that most of the politburo members must be fired for allegedly working against Mnangagwa. Ncube suspended the purchase of vehicles for ministers and Members of Parliament owing to a tight budget and as a cost-cutting measure. In the build-up to July 30 harmonised elections, Zanu PF refused to disclose the source of millions of dollars used to oil its campaign machinery amid claims that some of the money was diverted from Treasury. Opposition and former Zanu PF members alleged that a staggering $70 million was used to buy campaign regalia from China and the Democratic Republic of Congo. The ruling party’s parliamentary candidates were each given off-road top-of-the-range vehicles for their campaigns. After the polls, the party availed more than 70 vehicles for its departmental heads and secretaries.